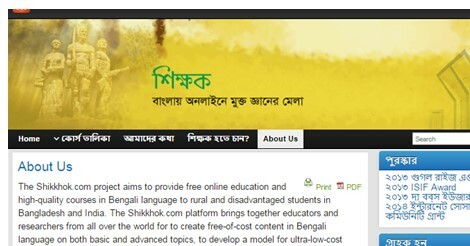 Shikkhok ( শিক্ষক ) is a new online learning educational website. It provides online Education in Bangla language with video lecture in Bengali. Shikkok project was founded in 2012 by Dr Ragib Hasan, Computer Science Professor at University of Alabama at Birmingham, England. 2013 Google RISE Award in Asia Pacific Region.